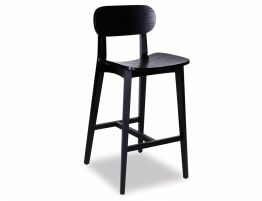 The Saki wood bar and kitchen stools are modern furniture design at its finest. 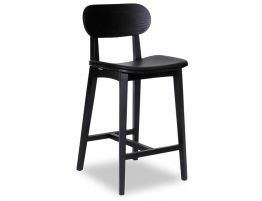 With a mid century feel, this contemporary stool blends the best of Danish inspired design with today’s styles. 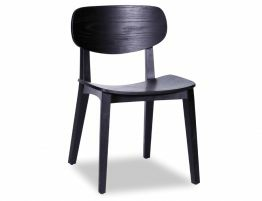 Bold and striking makes Saki a very appealing piece of design whilst curved seating with rounded corners brings a softness to it's all black design. 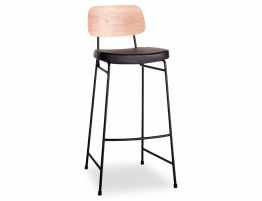 Contemporary or modern designed homes will welcome the Saki stool becoming accustomed to it's surrounds and complimenting your decor. 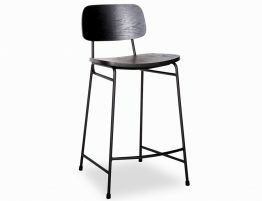 The addition of a padded seat finishes off the Saki stool with comfort as you sit back relax and enjoy your new perfect gathering place in your home. 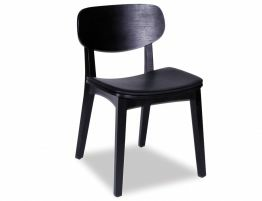 Custom your commercial projects with Saki, being available in both bar and bench heights, suitable for all your requirements. 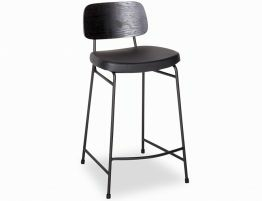 Bring a durable, luring sense across your room that Saki all black bar stools offer, and enjoy watching your clientele relax into the environment.